LARENCORE: U.S : Which corporations are funding today's KKK ? U.S : Which corporations are funding today's KKK ? It's time to expose the corporations enabling white supremacists groups. Join the fight against hate and support Black media ! It's been one year since the deadly Unite the Right march in Charlottesville, Virginia, and we must force America to wake up ! As we try to reverse the tide on rising white nationalism, a film coming out this weekend details past efforts to undermine a similarly violent movement aimed at maintaining white supremacy. We have two asks for you this weekend: 1. Go see this movie and support a high-profile effort to #TellBlackStories, and 2. Visit our Blood Money site and join the fight to destabilize hate groups by hitting them where it hurts the most: their bank accounts. While KKK chapters are dwindling, hate groups are on the rise - with over 600 groups adhering to some form of white supremacist ideology.3 In the 21st century, the new recruitment tool of choice is the internet — Facebook, Twitter and Amazon all have become the community groups, churches and newspapers used to swell the ranks of violent hate groups. Smaller communities like Berkeley, Portland and Charlottesville have become the site of their grotesque pageantry. And though Klan membership has declined, David Duke and people like him remain as influential as ever because they are able to have prominent profiles online and collect funding quickly through a variety of financial platforms. The hate and violence of the past thrives today, having been legitimized by the Trump Administration and corporate enablers that profit from hate. Companies like Discover and American Express continue to allow groups like Patriot Prayer to process donations on their platform, while Amazon sells racist propaganda for nearly a dozen hate groups and countless white nationalist leaders across their platforms.4 This has to end. So far, in partnership with members like you, we have already cut off funding sources of over 150 groups. Let’s go even harder and work to get the number of white nationalist groups thriving online down to 0. 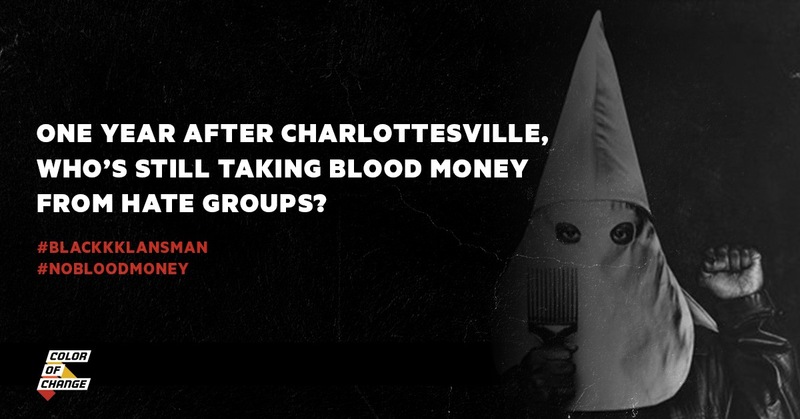 This weekend- join the fight against hate by seeing BlacKkKlansman and visiting www.bloodmoney.org to call out these companies online. Gather thousands of petition signatures and phone calls to send to the desks of CEOs of companies like Amazon and Discover. Expose corporations enabling hate groups through deep research into payment processors and who they serve. Run truth-exposing campaign ads to put payment processors’ image on the line, and pressure them to end their support of the far right. In just two days, the same racists that rallied in Charlottesville and murdered Heather Heyer will show up in Washington, D.C., to rally across the street from their Commander in Hate. But they’re flailing for funding because of Color Of Change’s Blood Money campaign. Jason Kessler, the organizer of the “Unite the Right” rally last year in Charlottesville, has recently been kicked off of PayPal. He’s stuck asking people to send him Bitcoin, checks and cash in the mail.5 But companies like Amazon and Discover are still allowing hate groups to use their platforms, which is undoubtedly helping violent groups like the Proud Boys and Patriot Prayer to organize armed rallies. This weekend, while white supremacists are gathering to cause chaos and division, let's call out the corporations who are enabling them and come together to support Black media.